This tutorial talks about the easy and effective method to detect interaction in a regression model. Interaction is defined as a combinations of variables. If the dependent variable is Y and there is an interaction between two predictors X1 and X2, it means that the relationship between X1 and Y differs depending on the value of X2. Suppose you need to predict an employee attrition - whether an employee will leave the organisation or not (Binary - 1 / 0). Employee Attrition is dependent on various factors such as Tenure within the organization, educational qualification, last year rating (, type of job, skill type etc. In SAS, you can run logistic regression with PROC LOGISTIC. 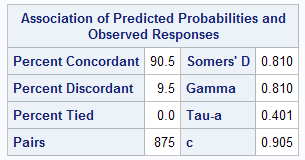 The c-statistics is 0.905. It is also called Area under Curve (AUC). It is an important metrics which helps to compare models. In the code, we are performing stepwise logistic regression which considers 0.15 significance level for adding a variable and 0.2 significance level for deleting a variable. AUC score has increased from 0.905 to 0.926. It means it's worth adding interaction in the predictive model. Make sure you check both training and validation scores when adding interactions. It is because adding interaction may overfit the model. Check AUC and Lift in top deciles while comparing models. Make sure no break in rank ordering when interactions are included. Adding transformed variables with Interactions make model more robust. You can add more than 2-way interactions but that would be memory intensive. 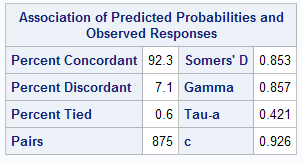 0 Response to "Detecting Interaction in Regression Model"